Home > Other Transport > Algae: The Future of Biofuels? Despite their evident potential, biofuels have undergone a few “false dawns” along the way – particularly when so much recent public concern and expert opinion has seemed to leave them heavily indicted in global food shortages and the rising cost of grain and other essentials. Never-the-less, the idea of being able to produce fuels to meet our future transport needs for renewable resources has a clear and self-evident appeal, especially with the ever-rising cost of traditional forms of energy – in both economic and environmental terms. Bizarrely, perhaps the best hope for the future lies in one of the oldest forms of plant on the planet – the algae. 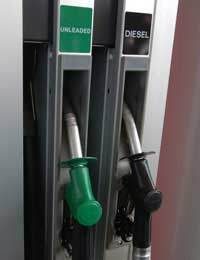 Traditional biofuels are plant-derived fuels such as biodiesel and bioethanol and have long been seen as a possible green alternative to petrol, diesel and other crude oil products which have played such a major part in our everyday lives for so long. Their main selling features are the fact that unlike the finite global oil supply, they are sustainable, renewable fuels, coupled with their claim to carbon-neutrality, only returning to the atmosphere the CO2 they took in while growing– not adding ancient, fossil carbon to the air. With its no-sulphur, no-aromatic chemical make-up and significantly better biodegradability than its traditional counterpart, biodiesel in particular seemed a bright new hope to launch an age of green travel. Unfortunately, with questions recently being asked about the real CO2 reductions achieved and concerns raised over the effect on agriculture in emerging nations and the amount of land and water needed to grow the crops in the first place, that new age never quite dawned. While diverting subsidised grain away from the hungry mouths of developing nations to feed the manufacture of biofuels is impossible to justify, no matter how laudable the overall energy and environmental goals, the same arguments do not apply to algae. This group of simple plants could possibly hold the answer to producing biodiesel without the need to compete with conventional agriculture for limited resources of land and water. A rich potential source of the world’s biodiesel, some forms of algae produce well over 15 times more vegetable oil per hectare than the kinds of crops currently used for biofuel production. In addition, as anyone who has ever had a pond or aquarium will testify, algae can grow at an astonishing rate, with some types of algae being able to double their size as often as three or four times a day. Their potential is clear. Growing algae is not difficult – it’s been done for years on a small industrial scale for the pharmaceutical and health food markets – but it’s difficult to achieve cost-effectively in the sort of amounts that a fully-fledged biofuel industry would require. There are over 100,000 kinds of potentially suitable micro-algae known to science and the race is on to try to find the ideal one to produce biofuels on a commercial scale. At least one of the major petro-chemical companies is looking into the idea, collaborating with several universities to find an algal strain which offers the optimum blend of oil-yield and growth rate. The idea is not a new one. Back in the oil crises of the 1970s, a number of countries, including France, Germany, Japan and the USA were actively researching the possibilities offered by algae. At the time, production costs were prohibitive and so, when crude oil prices dropped back to more acceptable levels, the work was shelved. With energy prices again rising, the world an increasingly volatile place and concerns over the environment running at an all time high, using algae has once again risen up the economic and political agenda. Scientific advances, particularly in biotechnology, make the prospect of biofuels from algae seem more likely than ever; if so, it could make a significant and – quite literally – green contribution to meeting our transport needs in the future.